Sketch has a lot of handy plugins, shortcuts and even keyboard stickers to speed up your design process and iterations. If you find this page useful, share it with fellow designers and developers. Arboards allow you to organize and place your designs in contextual flow. There are predefined Artboard sizes for iOS and Android devices, responsive websites, and icons, but you can always create a custom-sized Artboard. It's helpful to quickly rename your Artboards, Groups, and Layers as you create more of them. Rectangle R and Oval O shapes are foundational to any design. Multiple layers can be grouped and manipulated together. Similarly, a group of layers can be ungrouped quickly. Although there isn't a shortcut for creating a Page, you should consider using these shortcuts to navigate documents with multiple Pages. Artboards, Groups, and Layers can be duplicated anytime you hold alt when dragging anything in the Canvas. After duplicating, you can repeat the same action with the same position offset. Display the distance between surrounding layers by selecting a Layer. Shapes are the most common type of layers in your document. There is a variety of simple shapes which can be combined into more complex shapes. Create a Rectangle or hold shift to create a Square. Just a basic Rectangle with default corner radius of 8. Alternatively, you can create a Rectangle and set the corner radius manually. Create an Oval or hold shift to create a Circle. First, press O or R. To create a Circle or Square, simply hold shift while creating the Oval or Rectangle. By default all shapes are drawn from the originating cursor point. Hold alt while creating a shape to draw it from the shape's center point. Similarly, hold alt shift while creating the desired shape. Sometimes it is more useful to create a Rectangle R and adjust the height and width. With the active Vector Tool, you can create a new point aligned at 45° angles to the previous point. Straight line without control points. Control points are opposite of each other and mirror each other. Control points are completely independent of each other. Distance between the control points is independent, but they do mirror each other. If you want to edit an existing shape, double-click on it or press enter. Hold down shift while you click on points. The selected point(s) will have more pronounced border. Click on a line between two points, Sketch will insert the point exactly in the middle of the line. A complex shape is often composed of more basic shapes. With Boolean Operations you can combine basic shapes to create more complex ones. When you have multiple shapes selected, you can use these shortcuts. The result is a vector that is the sum of both vectors' areas. The result is a vector where the area of the top shape is removed from the one under it. The result is a vector consisting of the parts where the original shapes overlap. The result of a difference operation is the inverse of an intersect operation. To select and edit a Layer you can use the following shortcuts. Any shape can be turned into a mask. Any layers above the mask are clipped to its contents. Edit the vector points of the selected layer. Select any layer regardless of Groups. Holding shift will rotate the selected Layer in 15° increments. To restrict movement to a particular axis, hold down the shift key when you drag. The Smart Guides and distance parameters will help you align Layers within the Canvas. Move a layer in the respecting direction on the Canvas (hold shift for 10px increment). Enlarge a layer (hold shift for 10px increment). Contract a layer (hold shift for 10px increment). If select multiple Layers and want to distribute them nicely, you can use the Make Grid tool by going to Arrange › Make Grid. Additionally, you can distribute and align Layers using the Inspector's position buttons as shown below. Select multiple Layers and align the entire selection to their parent Artboard. Symbols is a powerful feature in Sketch that allows you to reuse elements easily across Artboards and Pages. If you Choose to Send Symbol to "Symbols" Page, you can use these shortcuts to navigate between your Pages. Simply, press enter on selected text layer or double-click it. Inserts emojis and special characters from a custom dialog while you are in text editing mode. This is especially useful for creating typographic logos as you will be able to manipulate every vector point independently. Inserts a line break in text editing mode. Simply double-click on a text layer or press enter. Additionally, once you are in text edit mode, you can open Spelling and Grammar pane. Once you are in text edit mode, you can dictate text instead of typing. Note: Enabling "Enhanced Dictation" option will download a 1.2GB file to your Mac. When you want to export your design you have to tell Sketch which part(s) you're interested in. Select the Layer (or Group) that you want to export and click "Make Exportable" in the bottom-left of the Inspector or go to Layer > Make Exportable. Draw a new Slice or make a Slice based on selection. Export the entire Canvas or only the selection. Once you save your Sketch document, your Mac will auto-save the file on a continuous basis. 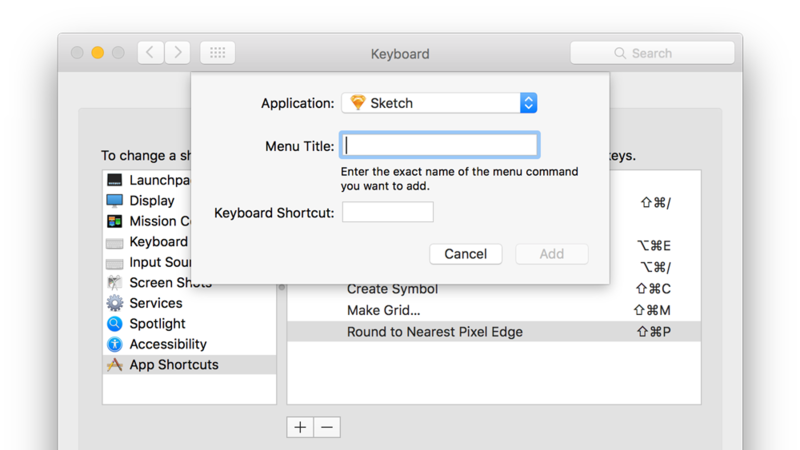 You can turn off and on this feature by going to Sketch > Preferences > General or ⌘ ,. Quickly search and filter layer names. See the Find input field in the bottom-left corner. By default, Paste will position the new copy over the original. With this shortcut, you will position the new copy in the center of the Canvas. Pixels will be more visible when you zoom in past 200%. Any edges that do not align with the pixel grid will be visible when you zoom in past 600%. Sketch's Canvas is infinite in size. You can scroll as far as you want in any direction and use these shortcuts to get back to your work. Zoom to specific area by clicking or dragging while holding Z.
Zoom out of specific area by clicking or dragging while holding alt Z. Hide everything except the Canvas. This mode is ideal for quick presentations. Custom shortcuts can be created via OS X System Preferences. To add your own custom shortcut, open your Mac's System Preferences > Keyboard > Shortcuts > App Shortcuts > Add. In the drop-down select Sketch under Application. 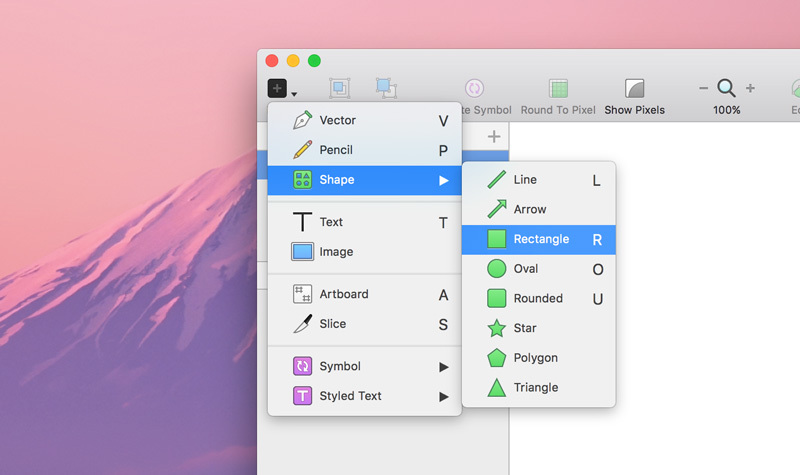 After you've selected Sketch you will be able to define your custom shortcut. After selecting a shape, perform basic math operations by focusing on fields in the Inspector with alt tab and moving through all numerical inputs with tab. You can add, subtract, divide, multiply, and in some cases, use percentage to tweak your shapes, as shown below. For exmple, you can select a shape and use +, -, *, /, and % in the numerical fields (position, size, and transform). In the radius input field you can specify a different value for each corner by using / (ex. 40/0/40/0). If you found this page useful, share it with fellow designers and developers. We'd love that!